Audience: Early elementary (Kindergarten- 3rd grade): I think that this book is something that younger kids can relate to. The early elementary aged kids still like the idea of kings and royalty and they can use their imagination to imagine themselves in the place of the little girl. Summary: This story is about a group of siblings who have lost their parents. One day the king hears about the siblings and decides that he wants to be their father and adopt them. The townspeople and the siblings think that in order for the king to adopt them, they must impress him. One of the siblings, a little girl, can’t seem to find anything that she is good at except showing kindness to those around her. In the end, the king longs for someone to spend time with him and not try to impress him and because of that- the little girl wins the approval of the king. Literary Elements at work in this story: One of the literary elements that I feel is important in this story is the plot. The events that go on in the story help us understand the meaning and overall theme of the story. It is important for us to understand the fact that the girl doesn’t believe she has any talent. It is essential for us to see how she has asked each of her brothers and sisters to help her learn a new talent. After no success- she realizes that all she can be is herself- giving her heart to whoever she comes across. The second literary element that is important is the theme. The theme of the story is how no matter what, if you show others your heart and spend a little time with someone, that is the best gift of all. For that person who really matters, they don’t want to be impressed by the talents that you possess, they want your time and your heart. How does the perspective on gender/culture/economics/ability make a difference in the story? : This story really emphasizes the different abilities of the children. Each child is unique in their talents (writing, singing, drawing, etc), but the one who gives of her time and her heart is the one that wins overall. Sometimes we might be too busy trying to impress someone that we miss what is really important. Theological Conversation: In the book, Just the Way You Are, you could easily substitute God in for the king. We can use this book to help the reader understand that all God wants is our heart, and for us to spend some time with him. How is this story like your walk with God? Do you every feel like you must try to impress God? How does it make you feel that God doesn’t want you to impress him, he just wants your heart? 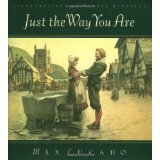 Just the Way You Are by Storypath is licensed under a Creative Commons Attribution-NonCommercial 4.0 International License.